Vice Admiral Vladimir Alexeyevich Kornilov (1806—1854) was a Russian soldier who took part in the Crimean War. 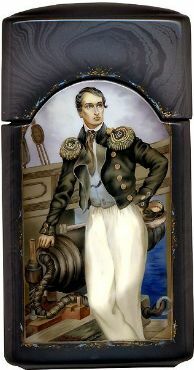 Kornilov joined the Imperial Russian Navy in 1823 and fought in the Battle of Navarino. He became chief of staff of the Black Sea Fleet in 1849. In 1853, his ship the frigate Vladimir sank a Turkish Vessel, the Pervaz-Bahri. During the Crimean War, Kornilov was responsible for the defence of Sevastopol. He was killed at the Battle of Malakoff and was buried in the Admirals' Burial Vault. The exterior of the piece is covered with light gray coloring decorated with blurry silver spots. The interior is traditionally red. In the center of the lid there is a gold and silver bluish floral design. The similar design can be found in the middle of the box's exterior bottom. The cigarette-case is made out of high-quality paper-mache. The lid isn't hinged. The work is signed by the artist. Note:the box was made and finished in private Workshops of Sergey Tyurin.